When you think of the popular Kit Kat candy bar, you probably picture classic flavors like white chocolate, dark chocolate and milk chocolate. What you probably don’t know is that there have been more than 300 limited-edition, seasonal and regional flavors of this candy bar produced in Japan since the year 2000. And these flavors are anything but basic. There’s veggie-flavored Kit Kats, fruit-flavored Kit Kats and even dessert-flavored ones. Although most of these original Japanese flavors aren’t available in stores within the United States, you can typically buy them on Amazon. Here are eight of the craziest flavors that you might want to consider taste-testing. We hope you find these products yummy! Swirled may be compensated when users click on the affiliate links in the story below. Prices are accurate and products are in stock at the time of publication. This unique Japanese Kit Kat takes on the interesting flavor of the purple sweet potato, the lesser-known cousin of the popular orange-fleshed variety. Customers compare the taste of this candy bar to that of sugar plums or plum pie. Many of those who have tasted it say that it’s one of the sweeter Kit Kat bars on the market. You can buy a box on Amazon for $17.98. Japan is known for its unique green tea-flavored candies and desserts, so it’s only natural that they’d come up with a green tea-flavored Kit Kat as well. Many customers who have tasted these candies maintain that chocolate and matcha green tea make the perfect couple. You can purchase this variety on Amazon for $10.99. We eat apple slices with peanut butter, so why not try an apple-flavored chocolate bar? 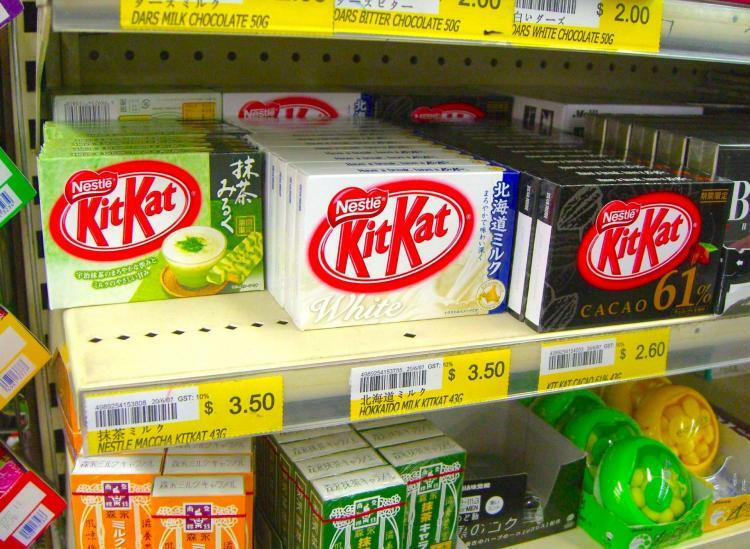 Apple-flavored Kit Kats are a favorite among Japanese Kit Kat fans. Many of those who have tried this candy bar maintain that you can actually taste the fresh apple in it. Some people compare the flavor to that of an apple pie covered in chocolate. You can buy a box of 12 mini bars on Amazon for $14.99. Nut-flavored chocolate bodes well in our book, so we’d be interested to try these chestnut-flavored Kit Kats. These original Japanese chocolate bars are made with white chocolate and filled with chestnut flavoring. Some customers also tasted a distinct cinnamon flavor in these bars. You can buy a box of them on Amazon for $12.99. This Kit Kat flavor is so standard that we’re surprised it can’t be found within the U.S. We’re guessing that it tastes pretty similar to most cookies ‘n’ cream candy bars — sweet and milky. You can buy a box on Amazon and taste it for yourself for $13.99. If you’re a fan of wasabi, you’d likely love these wasabi-flavored Kit Kats. But if you steer clear of wasabi at all costs, even when it comes to your sushi order, you should probably opt for a tamer Kit Kat flavor. According to some customer reviews on Amazon, these candy bars mainly taste like white chocolate with a subtle hint of spicy wasabi. Get a box of 12 mini bars on Amazon for $17.68. We’ve heard of chocolate-covered strawberries and chocolate-covered bananas, but chocolate-covered melon? Not so much. Still, we’re intrigued to try these melon-flavored white chocolate Kit Kat bars from Japan. One customer review on Amazon said that the melon flavor of these candy bars tastes “strong and delicious.” You can buy a Melon Kit Kat mini bar on Amazon for $8.98. This Japanese Kit Kat flavor is one of the weirdest ones on the market. It’s made with red bean paste and milk chocolate. Reviews of the candy bar are mixed, with some customers claiming that the flavor is “hard to describe” and unlike anything they’ve ever tasted. You can purchase a box of 12 mini bars on Amazon for $18.98.